The provision of an image of the deceased was an important element in the treatment of the body. The face was traditionally represented by a mask placed over the head and shoulders of a mummy, giving a lively but quite generalised appearance. 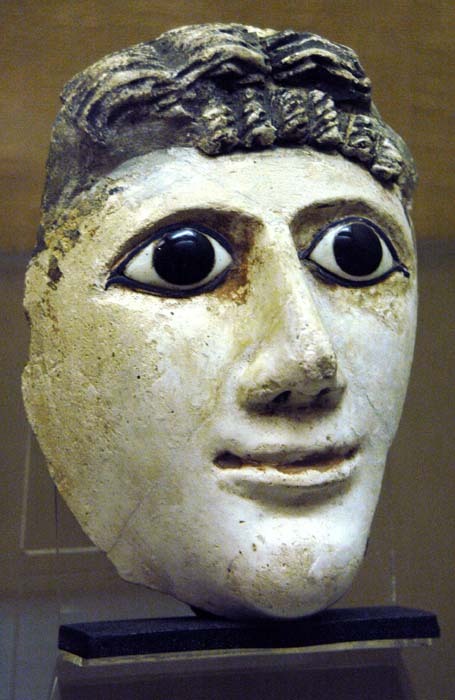 During the early Roman period, however, plaster masks of a more personal and contemporary style were used in some parts of Egypt. In other areas, an even more individual device was adopted - a painted portrait in Graeco-Roman style, showing the deceased with strongly characterised features. Such portraits continued in use until the fourth century AD, when the practice of mummification finally ceased. The portraits were painted on thin wooden panels in tempera (pigment mixed with egg) or encaustic (pigment mixed with wax, giving a textured and luminous effect). They were held in place by elaborate bandaging which enveloped the rest of the mummy There is evidence that some had originally been hung as framed pictures and were then modified for funerary use; most were probably prepared specifically for that purpose. They can be roughly dated by details of hairstyle, dress, and jewellery. Few painted portraits survive from elsewhere in the Roman world, and the numerous Egyptian mummy panels, preserved by their unusual use and the dry climate, are a striking example of the adaptation of a foreign and contemporary artistic convention to serve an old-established Egyptian custom. Top: funerary mask of a woman; plaster with inlaid eyes of glass and marble. Provenance unknown; 1st-2nd century AD. Left: an unusual example of a double-sided portrait. There is a strong likeness between the two images, suggesting that the subject is the same woman, but one version is plainer and less flattering than the other. Encaustic paint on wood. From el-Rubaiyat, Faiyum; 2nd-4th century AD). Right: portrait of a young man; encaustic paint on wood. From Tanis in the Faiyum; first half of the 3rd century AD).